In this section, we will go over the basic SVG shapes again and how to create them using D3.js. We will cover previous SVG basic shape examples and how set their attributes using D3.js. We have also constructed SVG Circles using D3.js in the previous section (Using JSON to Simplify Code). The necessary SVG attributes for drawing a circle are the "cx", "cy" and "r". Note - If we leave off the style method, then we get a black circle. Which is fine, we care about making a circle first and foremost, then after that we can style it. Notice that the important attributes we need to draw an SVG Circle in D3.js are - cx, cy and r.
Using the Circle example, you can probably guess that to build a rectangle, you will need an "x", "y", "width" and "height". The necessary SVG attributes for drawing a rectangle are the "x", "y", "width" and "height". Note - If we leave off the style method, then we get a black rectangle. Which is fine, we care about making a rectangle first and foremost, then after that we can style it. The SVG word for rectangle is rect. Which makes the append operator .append("rect") not .append("rectangle")! Notice that the important attributes we need to draw an SVG Rectangle in D3.js are - x, y, width and height. Using the Circle and Rectangle examples, you can probably guess that to build an ellipse, you will need a "cx", "cy", "rx" and "ry". 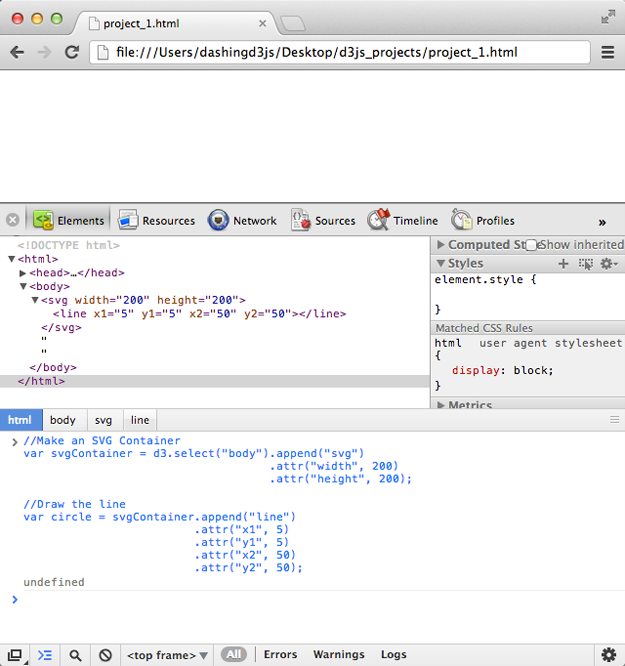 The necessary SVG attributes for drawing an ellipse are the "cx", "cy", "rx" and "ry". 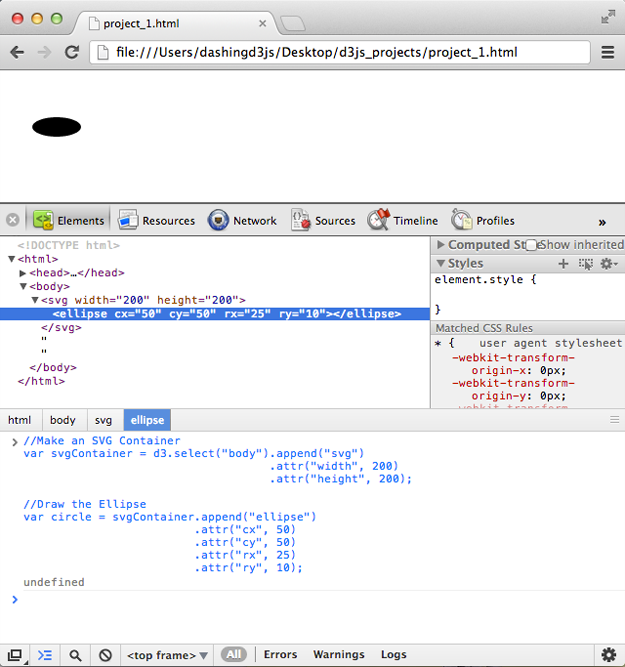 Note - If we leave off the style method, then we get a black ellipse. Which is fine, we care about making a ellipse first and foremost, then after that we can style it. 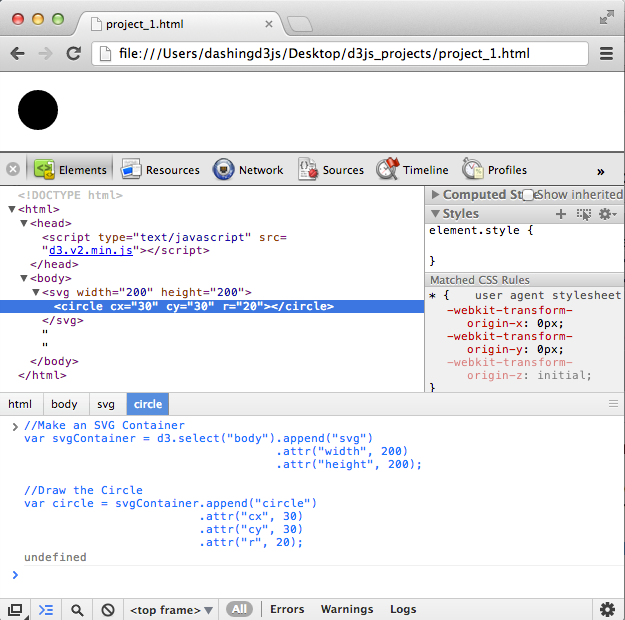 Notice that the important attributes we need to draw an SVG Ellipse in D3.js are - cx, cy, rx and ry. Using the Circle, Rectangle, and Ellipse examples, you can probably guess that to build a straight line, you will need a "x1", "y1", "x2" and "y2". Wait a second?! Where is the line????? 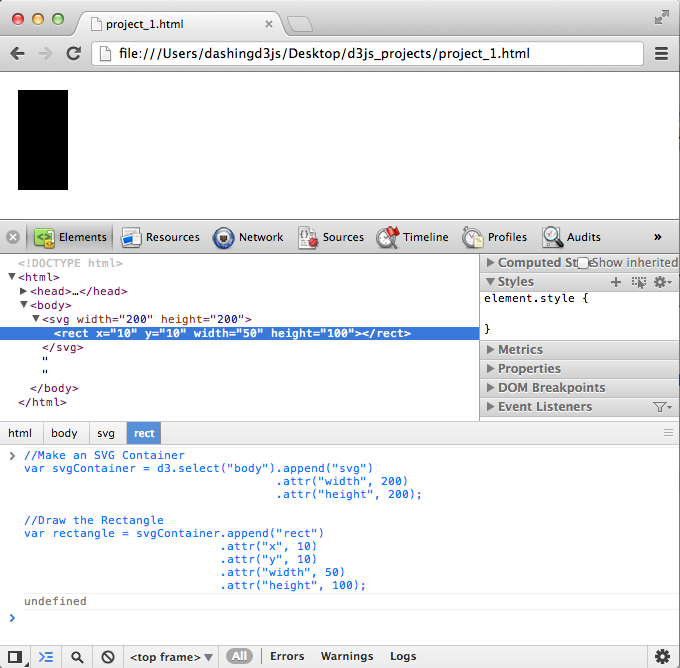 The SVG element is there, however we can't see it in our browser. It turns out because the SVG ‘line’ elements are single lines and thus are geometrically one-dimensional, that is - they have no interior. 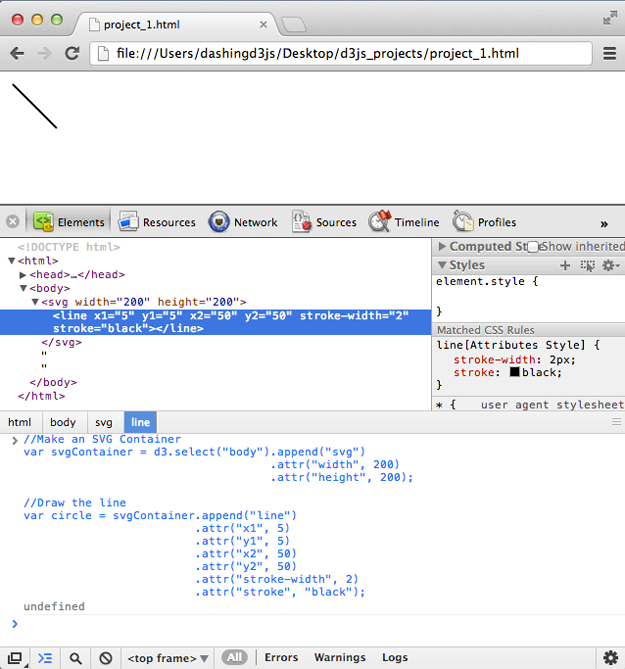 Which means that ‘line’ elements are never filled (see the ‘fill’ property). Which means that our line does not take up space - so we don't actually see anything. Fantastic - now the line is visible! The necessary SVG attributes for drawing a straight line are the "x1", "y1", "x2", "y2", "stroke" and "stroke-width". Note - We don't use a style method with the line. Because ‘line’ elements are single lines and thus are geometrically one-dimensional, they have no interior. Which is why to style them we need to deal with the "stroke" color and "stroke-width". Notice that the important attributes we need to draw an SVG Straight Line in D3.js are - x1, y1, x2, y2, stroke-width and stroke. The basic shapes we still have to cover are "Polyline" and "Polygon". 2  <polyline fill="none" stroke="blue" stroke-width="2"
2  <polygon fill="yellow" stroke="blue" stroke-width="2"
Using the Circle, Rectangle, Ellipse, and Straight Line examples, you can probably guess that to build a Polyline and Polygon, you will need a "stroke", "stroke-width" and "points". And "fill" for the Polygon. However, as you can see from the examples above - the points attribute contains a list of points where the x and y are separated by comas and different x and y coordinates are separated by spaces. Building this out easily in D3.js is not pretty. Because D3.js loves data visualization and pretty things, the D3.js convention is to use the D3.svg.line() generator for polylines and polygons. To construct the Polyline and Polygon SVG Basic Shapes using D3.js, we will have to learn about SVG Paths.